A fishing ship carrying 600 (yeah that’s right – 600!!!) illegal driftnets stretching up to 18 miles has been seized after an extensive chase by Interpol and various authorities. The STS-50 (its current name) has been using the flags of eight different countries to evade capture. It has also been changing its name on a regular basis to conceal its identity, with Sea Breeze, Andrey Dolgov, STD No. 2 and Aida, all being used prior to its current name of STS-50. The vessel, STS-50, had been illegally targeting Toothfish in the Southern Ocean close to Antarctica. The vessel had no quota, so cannot legally fish in Antarctic waters. The drift nets being used are also banned in Antarctic waters because of their capacity to catch seabirds, mammals, and their indiscriminate killing nature. 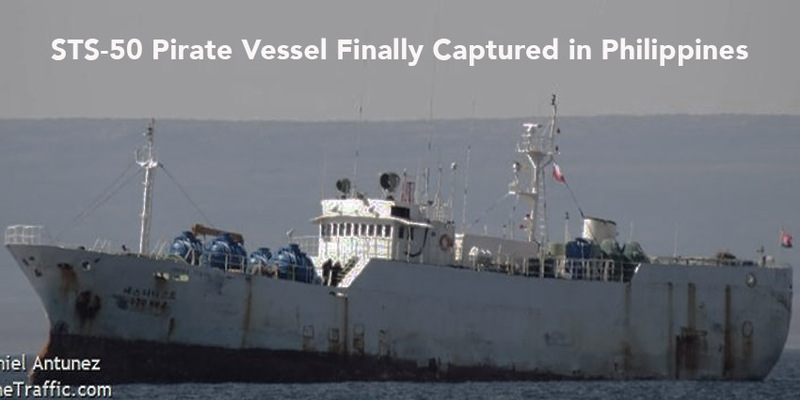 Amazingly this vessel has been caught twice in recent years and in both cases the vessel “ESCAPED”. The first time was in China, and the vessel, despite being impounded, slipped out of port unnoticed. Then they did the same vanishing act in the port of Maputo in Mozambique. This of course happens through bribes. A few years ago we bought an illegal fishing vessel into Liberia and handed it over to authorities. The following day it was gone, and on doing some digging, found out that moneys was paid and the port authorities looked the other way as it slipped out of the harbor. Thankfully this time the boat may not be getting away so easily. It’s been caught in Indonesia. Now I’m not always complementary of Indonesia and their approach to illegal logging and palm plantations, but when it comes to illegal fishing, they have demonstrated considerable resolve in tackling the issue head-on. Most of those images of illegal fishing boats being blown up come from Indonesia. So I doubt this vessel will be escaping anytime soon. In this instance, Indonesia was acting on a request from Interpol when it seized the officially stateless craft. It is nice to see Interpol continuing with its efforts on illegal fishing. “Navy ship Simeuleu conducted a ‘stop, investigate and detain’ operation on Friday and successfully seized the vessel.” Shipping data in Thomson Reuters Eikon shows the 54m-long, 452-tonne vessel was built in 1985. At the time of its capture, the STS-50 had 20 Indonesian and Russian crew. It was not immediately clear what would happen to them. Navy deputy chief of staff Achmad Taufiqoerrochman was quoted in the statement as saying the Indonesian crew lacked travel documents and had been at sea for a long time without pay, indicating they may have been victims of trafficking. People trafficking laws are often an easier way legally to impound vessels compared to fishery laws. Will keep ya posted.